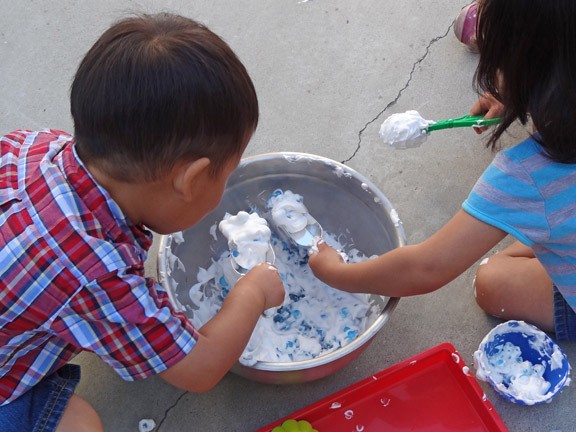 Sensory play is very important for young children’s development, and I feature a lot of sensory play activities on my blog. I was initially drawn to sensory activities to help my kids, both of whom exhibited sensory challenges when we adopted them as toddlers. Part of the way my husband and I supported the kids’ ability to tolerate new sensations was through sensory play. Today, I’m happy to say, neither kid exhibits tactile defensiveness anymore. Nonetheless, I’m always looking for new sensory activities to keep them stimulated. We’ve played with water beads on more than one occasion. So when we had leftover water beads from another activity, I was looking for a creative new way to use them. 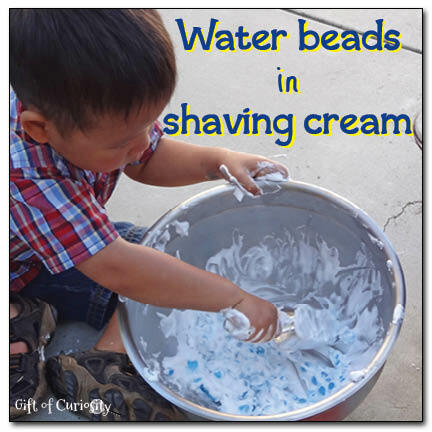 On this occasion I decided to combine water beads and shaving cream for some sensory play fun! 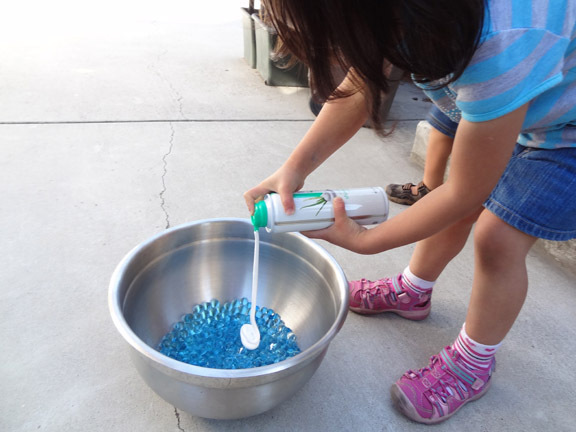 The kids added the shaving cream to a bowl with water beads. 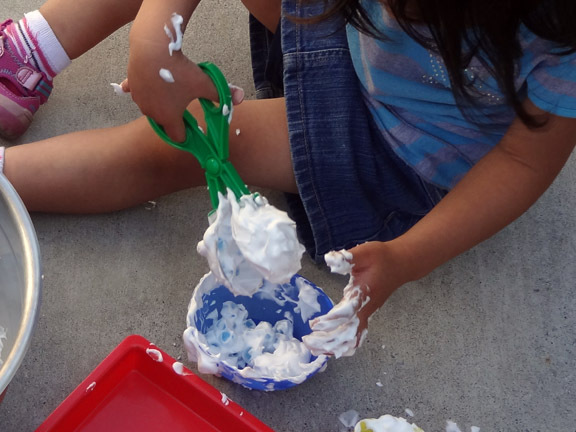 And once they had enough shaving cream, the real fun began! 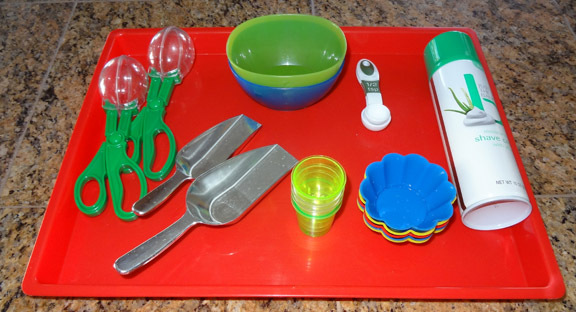 They used the scissor scoops and the metal scoops to grab the water beads and put them into their bowls and cups. On this day they were more interested in using the various scoops than their hands, but of course their hands still got messy. And messy hands are a-okay with this mama! 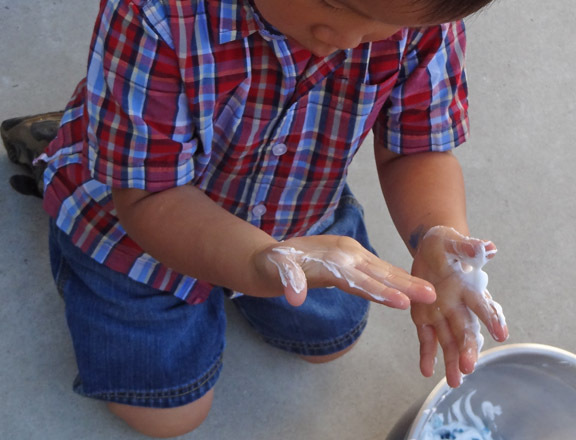 For more activities that will delight the senses, see my Sensory Play page and my Sensory Play Pinterest board. Follow Katie @ Gift of Curiosity’s board Sensory Play on Pinterest. Love this! My girls would have a blast! 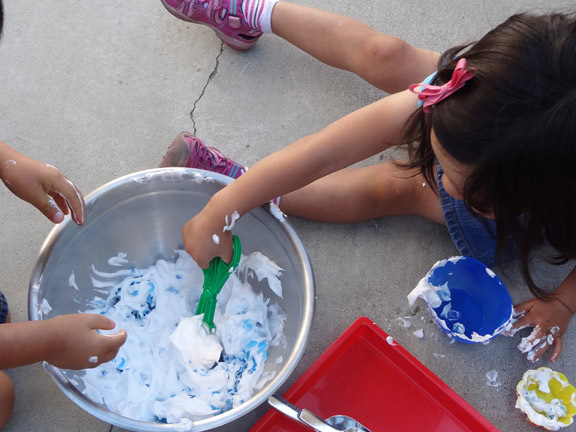 I used to use shaving cream in my classroom to clean my tables, so I would let my students write on the tables (cleaning) before I wiped it off 🙂 Thanks for sharing over at the Thoughtful Spot Weekly Blog Hop! I chose you as one of my favorites from last weeks hop! I can’t wait for each of your new posts! Your ideas and materials really motivate me and my kids! The sensory ideas are amazing! There are so many different materials out there, but it’s fun to see how you mix and match plus share great ways to use the materials. Thank you for your sharing!! !